Inside this box you'll find the secret to creating the authentic flavors of Latino cuisine. 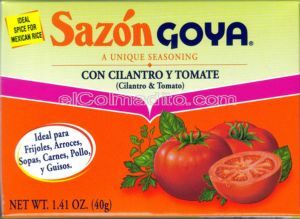 Goya Sazón’s special blend of seasonings makes every dish it graces taste truly exceptional. Just one packet makes a world of difference. Salsa de Tomate Goya, Pasta de Tomate Goya Corned Beef Coronado.